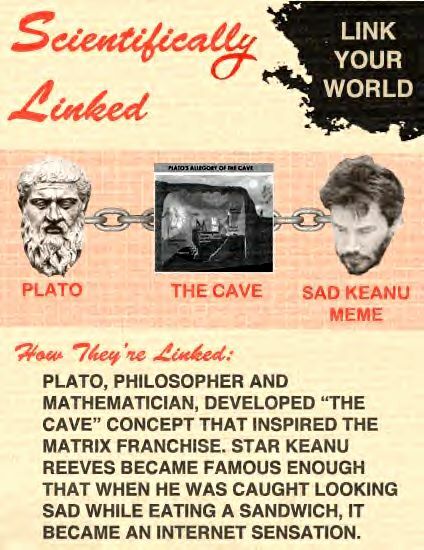 Stonewall Gazette: Plato started the sad Keanu meme! It all started with the above paparazzi image. Doesn't Keanu Reeves look so sad? Cheer up, guy! In an effort to make Keanu feel better, some Keanu fans have designated June 15th as Keanu Reeves Day. Others insist that it's July 1st. What do you do on Keanu Reeves Day? The ball continued rolling on Reddit, with this epic Keanu appreciation thread with over 2,000 comments. 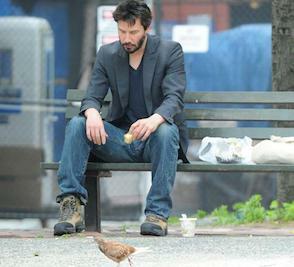 Then someone posted a photoshop of Keanu eating a bird. Then came this photoshop of Keanu eating a miniature version of himself on a bench. From there, someone suggested that there be a holiday to celebrate what a good guy Keanu Reeves is. Finally, someone suggested a day to celebrate Keanu on July 1st, during which people would give money to cancer research. See more Keanu images here!